For Vivienne, life with her assistance dog Poppy brings walks, shop visits, laughter and games. It wasn’t always this way. In 2015, Vivienne was diagnosed with breast cancer and after that she developed crippling anxiety, depression and agoraphobia. She could no longer work, barely left the house and few things were making a difference. She began working with the Brotherhood’s NDIS team at Rosebud, on Victoria’s Mornington Peninsula, earlier this year. Our Local Area Coordination (LAC) service assists people to navigate the National Disability Insurance Scheme (NDIS). Through LAC, we provide planning and coordination for people with disability to maximise the choice and control over the services they use. This includes support to navigate mainstream services and to increase their capability to be an active part of their community. Local Area Coordinator Claire Driver says the approach to creating Vivienne’s NDIS plan considered the circumstances she was facing and her difficulty with going out. “Communicating face-to-face with a client and not over the phone is much better,” says Claire. During her NDIS planning meeting, Vivienne described the bond she shared with Poppy. 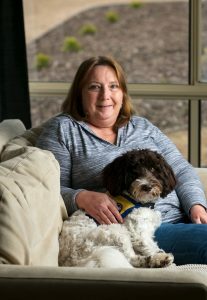 “Poppy is accredited with MindDog Australia, and is easy to train – she has to be like that to be a therapy dog.” But Vivienne told Claire she was struggling with Poppy’s upkeep. Understanding that Poppy was an important element of Vivienne’s wellbeing, Claire was able to ensure funding was included in Vivienne’s NDIS plan which would cover the ongoing costs of the assistance dog. That was a great relief and has given Vivienne a real boost. “Since having Poppy, I’m going out more, she has improved my life so much. I still struggle but she gives me security and reassurance. I would still be behind closed doors if it wasn’t for her,” says Vivienne. Poppy enjoys the company of other dogs when she goes to the park and when she is not ripping the stuffing out of fluffy toys. The Brotherhood of St Laurence is the local Partner in the Community in the delivery of the National Disability Insurance Scheme (NDIS) across the North East Melbourne, Hume Moreland, Bayside Peninsula, Western Melbourne and Brimbank Melton areas.